The days of needing specialized computing hardware and sophisticated know-how to mine digital currency are over. Anyone can easily mine Verium. Just download the Verium Vault software to any computer, click mine and starting earning Verium, the digital gold that backs the digital currency VeriCoin. Verium is one of the few digital currencies that can not be mined by specialized GPUs and ASICs.By making it easy for anyone and everyone to mine Verium the project has created a more decentralized system. As mining power increases the reward slowly decreases, this mechanism makes the reserve commodity supply curve drop based on increased demand and can drive a value increase over time and increased usage. The overall network can be viewed in the Live Global Mining Statistics. The network difficulty evolution is displayed here. Details for pool miners or solo miners. The first mining software especially designed for Verium was provided by Douglas Pike aka effectstocause, one of the creators of this project. Based on effectstocauses original miner fireworm has created an update which includes several optimizations especially for Linux (memory) and ARMv8 CPUs. cpuminer, cpuminer-opt can be used as well. Solo mining is not for everyone but with a little patience and determination even low hash rates can render results. While rare, when it occurs it is very lucrative. If you have over 15Kh/m and don't mind waiting for your rewards, there are several advantages. All transaction fees per block! Once you have your verium wallet installed, you must edit your verium.conf file. The following example assumes your local network is 192.168.1.0/24 and your wallet has an IP address of 192.168.1.10. You will need to keep your 'rpcuser' and 'rpcassword' when you point your miner to your wallet. Once you have you wallet setup. You can start pointing your miners to mine direct. Pay Per Last N Shares (PPLNS) - A PPLNS pool is the same as a Prop pool in so much as the miner takes the risk of variance. Where they differ is how the payouts are calculated. PPLNS pools were designed to stop pool hoppers as they don’t technically payout the current block, rather they payout based on an average of the shares you submit over the last x number of blocks. As a result, when you first start mining on a PPLNS pool like d2’s pools you’ll notice that you hardly get paid anything until a few hours later. This will ramp up over time and once you stop mining, you still get paid for a few hours… this is due to the “buffer effect” of PPLNS and pool hoppers hate this as they cant jump on a fresh, profitable round! You, as a loyal miner still get the correct amount eventually but you have to be a bit patient for the ramp up and ramp down times. NEW: Detailed overview of all pools. Weblogin is your registered username from Step 1. Workername and WorkerPassword are the values you set when you created your worker in Step 2. 'Note:' These command lines are for Linux. If you are using Windows, replace the "./" with the path to your .exe file. How to set up a Verium Mining Pool. Reminder: when solomining there is zero downtime, zero pool fees, zero withdrawal fees, zero trust, zero dependency, plus all transaction fees per block! Fee efficient payout is 20 VRM (which will cost 0.2 fee). See a comparison of hashrates across a variety of processors! Help us out by adding your hashrate to the growing database! Please make your own copy of this spreadsheet by selecting "File > Make Copy"
If you are planning on purchasing hardware for VRM mining there are 4 main routes you can take. The fasted ROI can be had from used server hardware; the best long term profitability comes from used laptops and SBC’s. If you have a Raspberry Pi at hand there is an OS image with pre-installed Web-based Miner Monitor for easy use. another one here by wienerdog. Miner.farm is interesting. Needs some set-up and shuffling of binaries but it also allows control of miner (at least start/stop) from any web browser. I have played around with it some. Very spiff. Not $cheap. Low system resource use. Minera can be set up for custom local-miner and also can monitor miners on your LAN by RPC. ad-supported $free. I have played with it, some. Spiff. Easy install and set-up. Requires node.js and all the system overhead that comes with it. 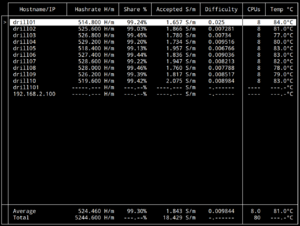 Right now Minera does not appear to work with Fireworm's cpuminer port. in a terminal. If they are connecting means they are working. A python script to help monitor miners on a LAN, great for small to moderate sized SBC setups. So long as cpuminer is configured with the correct api-bind option, this script will work regardless of worker architecture. NOTE: different miners may not report all currently displayed information. Another python script to monitor miners, with focus on pool mining with grouped workers (ie. several cpuminer instances using the same pool worker id). Supports querying MPOS API to measure difference between cpuminer-reported hashrates and pool-reported hashrates. This page was last modified on 21 July 2018, at 08:10.